Because of a concert being performed in the Church on Tuesday, 21st November, the practice at Ryde has been cancelled. However, we have been invited to the practice at Newchurch on Thursday of the same week. Practice commences at 7.30pm. I hope all that usually come to Ryde will make the effort to help Newchurch band at what is now a critical stage in their handling and ringing and moving on to the next stage for the local band. Saturday, 7th October, saw the annual competition take place on the Island for the Fred Green Memorial Change Ringing shield. Fred was a ringer of long standing at Freshwater and this year the competition took place at his home tower. Freshwater is a 6-bell tower with a 17cwt tenor. Five towers entered the competition with a scratch team made up to give us something to aim for! 120 changes of any method of Doubles or Minor can be rung. Julian Hemper from Devizes in Wiltshire, a former Ryde ringer, journeyed over to judge the afternoon’s efforts. His helpful comments after the ringing and before announcing the awarded points were all taken on board and appreciated by all the teams. First to ring were the team from Ryde, who suffered a mishap with the treble during the 2-minute trial which unsettled the team a bit. Next to ring were Brading, followed by Shanklin, Freshwater, Brighstone and finally the scratch team, Team Isle of Wight (TIOW). The order of points awarded were as follows: 1st, Brading (12½ faults); 2nd, Brighstone ( 16½ faults); 3rd were the TIOW but were not challenging for the shield (17 faults); 3rd, Shanklin (19½ faults); 4th, Ryde (21 faults); 5th Freshwater (32½ faults). So with only 20 points between first and fifth a very credible afternoon of ringing. The team from Brading were: 1, Robyn Downer; 2, Marghanita Allen; 3, Geoff Wilkins; 4, Margaret Downer; 5, Revd Barry Downer (conductor); 6, Kieran Downer. Photo shows the winning team with (left to right): judge Julian Hemper, Revd Barry Downer, Marghanita Allen, Robyn Downer, Kieran Downer, Margaret Downer and Geoff Wilkins with mascot Mitchell holding the well deserved certificate. Our thanks to District Master Jenny Brudenell and Secretary Mary Tester for organising the event, to Julian for making the supreme effort of battling our transport system and especially to the Freshwater team for the superb spread of sandwiches and cakes to go with the tea and coffee. In all a very sociable afternoon. A suitably well-struck quarter peal took place for Harvest Festival Evensong and the addition to the family of Amy and Dan Shave, daughter and son-in-law of Angela and Revd Canon Graham Morris, incumbent at Ryde. Rung on Sunday this was a good ring for a lovely occasion from our local team, well done to all and congratulations to the Shave household from all at Ryde tower… and of course the proud new grandparents! Good news all. Because we have had to cancel this Tuesday’s practice at All Saints, Ryde, Lexi and Kieran have offered us St Michael’s at Swanmore from 7.30 which will follow on from their own practice at 6.30. So come and have a go at something a bit different for a practice night! My thanks to both Kieran and Lexi for helping us out. Saturday, 23rd September, is Isle of Wight Day and to celebrate lots of events were organised and took place across the Island. Bell ringing included general ringing from Newchurch, with a 9am start! Ryde, Swanmore, Brading and Shanklin also took part and a quarter peal at Brighstone was scored. Kieran Downer watches nephew Mitchell at Shanklin as he rings the tenor. Last Sunday (30th July) All Saints’ at Ryde opened its tower to general ringing and tea and cake were served in the Church Hall by local ringers. An exhibition of the Island quarter peals and full peals volumes were on display together with other historical facts about Ryde tower. Those who attended found these interesting as they looked for their own past achievements. The Evening Service took the form of a Dedication for a new Peal Board which will be sited in the tower shortly. The peal was rung one year ago to the day in memory of David Dark, Julian Hemper’s Step-father, a prominent member of Ryde community. Revd Canon Graham Morris led the service with bell ringer Revd Barry Downer giving the Sermon. Some of the hymns and prayers were also bell ringing related. 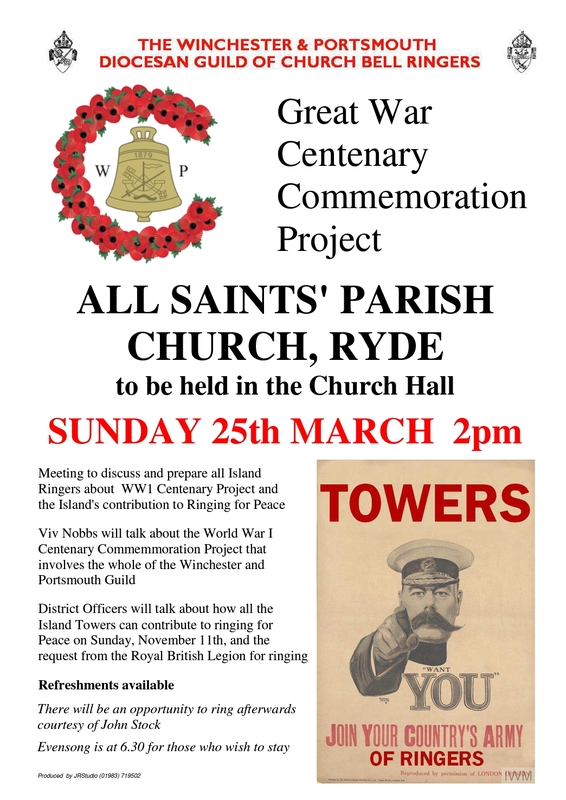 Thank you to all Ryde ringers in helping to organise and run this event and to Canon Graham and Rev. Barry for organising and taking the Service. Over this weekend All Saints’, Ryde, has been celebrating the 30th (Pearl) Wedding Anniversary of Angela and Graham Morris and the 30th Anniversary of the induction at Hereford of Revd Canon Graham Morris, he who is in charge of us in this Parish. Tim in reply: ‘Yes, it’s for you and Mum you daft ….’, apparently tears followed. Celebrating the 30th Wedding Anniversary of Angela and Graham Morris and the 30th Anniversary of Revd Canon Graham’s Induction into the Priesthood. First quarter peal since recently completed repair work. Following this some of us joined in the party atmosphere and prior to leaving the Church left a small gift of our own for Angela and Graham to help in the celebrations. Following Morning Service today the party continued with son Tim and daughter Amy embarrassing their parents by giving those in Church a ‘red book’ moment of past events, enjoyed by all those present: queue more tears. Thank you bell ringers and flower arrangers at All Seasons in Cross Street, Ryde, for pulling out all the stops to help me organise our part in this weekend, you truly have made a splendid effort. RYDE PRACTICE CANCELLED TONIGHT (Tuesday, 27th June) – PLEASE NOTE. After 9 month’s of painful silence All Saints’ bells, Ryde, are now fully up and running and this Saturday (10th June) we will attempt a quarter peal in celebration of their return and if successful will be dedicated to the Official Birthday of HM The Queen, and also the 96th Birthday of HRH Prince Philip on Saturday. An all-Island team has been assembled and ringing will commence shortly after 10am – we all look forward to successfully celebrating the completed repair work. My eternal thanks to all involved in the work, which has been a challenge to say the least, in what was originally only intended to take 3 month’s, for their time, patience and hard work. All Saints’ Church, Ryde, was the venue for a visit from the Vectis 1940s Vintage group. After a talk in the ringing room about bells and bell ringing locally and Island-wide, particularly about what occurred during the war years, the group were taken up to the parapet for some spectacular sites of the Island and mainland coastline. Following the descent, some of whom found it more onerous than they first thought, a tea was served in the Church Hall, which also had a 1940s feel to it, which had been set out with an exhibition of the history of Ryde tower from 1886. A big thank you is due to all Ryde ringers for their contributions of help and cake. All Saint’s Ryde will shortly host a 1940s style afternoon in the Church Hall. Open to all who would like a bit of nostalgia and history. Oh and CAKE as well! Tower Captain John Stock has received an email from Taylor’s of Loughborough with the news that the work being done on Ryde’s wheels and clappers will not be complete before March. In view of that, a practice combined with Newport ringers has been arranged for tomorrow (Monday, 23rd) at 7.30pm at the Minster and a Ryde practice at Carisbrooke tower has been set for 7.30 on Tuesday, 31st January. Anyone who would like to join us please feel free to turn up – we need the practice! Great news from Kieran Downer and the team – there’s so much interest in the bells here (see Pompey Chimes, yes they’re in there – again!) that a weekly practice night is needed! So if you are local and you’d like to find out about bellringing, you’re an absolute beginner or wanting to improve or learn about the uniqueness of 3-bell rounds… see you on Tuesdays from 6.15pm at St Michael’s (Wray Street entrance). Ring the bell outside the vestry door and you will be shown the way to the tower. Several young learners who started last year getting on very well with handling and getting to grips with all things bells – well done all of you. Those of you organising tours to the Island will find these unique steel bells are now on the ‘to go to’ list when you are over here, so rise to the challenge! That now makes 15 ringing towers on the Island for you to choose to ring at. Really not enough hours in the day are there? Better make your trip a week and enjoy some of our other world renowned attractions whilst here. Tourist advisers on hand if you need them – just ask!